Mike Vanderjagt Accused Of Grabbing Middle School Student Who Taunted Him With "Wide Left! Wide Left!" Mike Vanderjagt spent eight seasons as an NFL placekicker, and he was very good at what he did: In 2003, Vanderjagt became the only kicker in league history to go an entire season—playoffs included—without missing a field goal or an extra point. And he still ranks second all-time in career field-goal percentage. But there was that one missed 46-yarder at the end of that one playoff game against the Steelers in January 2006, after which the Colts didn't re-sign him and he played just one more season as a member of the Cowboys. Turns out Vanderjagt's still a little uptight about that. These days, Vanderjagt runs a pizza joint in Marco Island, Fla. He's also a part-time soccer coach at a charter middle school there. But his position at the school may be in jeopardy because he allegedly grabbed a student by the throat for teasing him about that one missed kick. The incident took place on March 12 when Marco Island Police responded to a call from Mark Albanese, dean of students at the school, who reported an adult male grabbed a student by the throat. Since the incident happened at the end of day, the student involved and witnesses had gone home. Police investigated the following day, talking to students at the scene and to Vanderjagt. One student was taunting Vanderjagt by yelling "wide left, wide left" through a rolled-up poster board that acted as a megaphone, according to a Marco police report. "During his career, he missed a very important field goal attempt during a playoff game," the report stated. 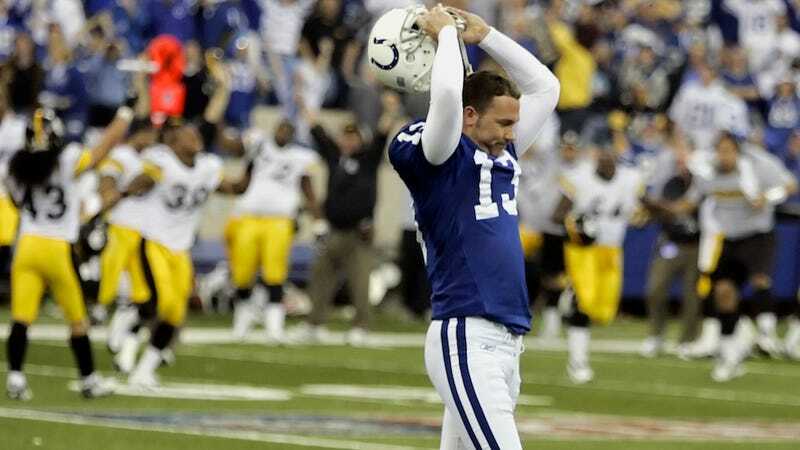 Vanderjagt played for the Indianapolis Colts and was one of the most accurate place-kickers ever in the league. Vanderjagt, a school parent and volunteer, was walking through the parking lot when he overheard the comments. One student alleged Vanderjagt walked up to him, grabbed him by the throat and started cursing at him, according to the police report. Another student corroborated his story. Vanderjagt told police, after hearing the taunting remarks, he approach the student placing his hand on the child's shoulder at the base of his neck. Vanderjagt told police some students had been making disparaging remarks toward him for months. He said he had become fed up with the behavior. The police went so far as to send the case to the state's attorney's office, which determined that no criminal charges would be filed. Vanderjagt has been suspended as a coach. He apologized to the student and to the student's parents, and the athletic director has recommended that he be reinstated. Vanderjagt told the school board the student has apologized to him. Which is the right thing for the kid to do. After all, he should have been shouting, "Wide right! Wide right!"